Is a Cairmal Dog the Right Maltese Mix for You? They are one of the relatively unknown Maltese mixes, but are becoming more popular because of their lively and spirited personality. Read more about the Maltese Cairn Terrier mix below to see if this is the right Maltese mix for you. Do you have a Cairmal? Tell us more about his/her personality & your dog could be famous! These dogs take on the temperament of both Cairn Terriers and Maltese. They are spirited, restless little dogs. Maltese Cairns are also easy to train and love to show off by doing tricks. You need to give them lots of attention and training though, since they can become destructive and noisy if left alone too long. This dog does great with children as they are naturally patient and very playful. Most people find them to be loveable and loyal; while also being merry and mischievous. If you already have a Maltese Cairn Terrier dog or know someone that does, check out these unique gifts for dog lovers below. 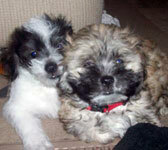 A Maltese Cairn Terrier mix comes in various colors such as red, brindle, black, sand and various shades of gray. Hair usually includes a shaggy outer coat with a soft, downy undercoat. Therefore, they need to be brushed several times a week and trimmed monthly to keep their coat from getting matted. Most are also nonshedding and hypoallergenic. Full grown Malticairns average 10-14 lbs, about 4-6 lbs larger than a purebred Maltese. Do you have a Cairmal? If so, your Maltese mix could be famous! Please tell us all about your dog and we'll put it on our website. What kind of personality does s(he) have? What makes him/her so special? Let other Maltese Maniacs know what to expect from a Cairmal. Submissions must include at least 200 words of text and a picture to be accepted. Thanks! So so smart and sweet. Mother Cairn Terrier, father Maltese.